This statement proves to be ominous in John Singleton’s 1991 Oscar-nominated film, his very first as a director. Set in the South Central LA neighborhood of Crenshaw, the film paints a vivid and very blunt portrait of inner city life. Drug abuse and violence are rampant, father figures are nowhere to be seen, and most disputes are solved with guns, not fists. This is the kind of place where you could walk to the corner store and not make it back alive. Tre Styles (Cuba Gooding Jr.) has spent most of his life growing up in such a place, and he is one of the select few who have been able to avoid most of the issues that have plagued so many others in the area. This can mostly be attributed to the presence of his father, Furious (a then “Larry” Fishburne), a strict parent who is also a positive role model. Furious is always there for his son, continually preaching good behavior with a strong sense of awareness. 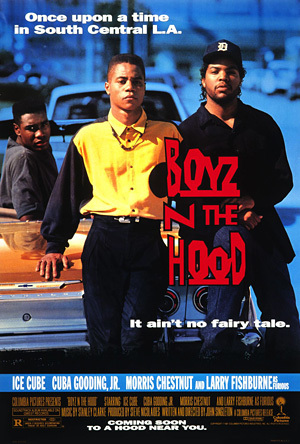 On the flip side, Tre’s best friends from childhood, “Doughboy” (Ice Cube, in his first acting role) and his half-brother Ricky (Morris Chestnut), have been raised by a single mother. There is clear bias in their household. Ricky is the mother’s favorite, and she puts all of her energy into helping him get to college, babying him in the process. Doughboy, on the other hand, is a nice guy, but he’s also a high school dropout who would rather sit on his porch getting high and drinking 40s. He also doesn’t have the football skills of his brother to fall back on. Also on the block are plenty of gangbangers and crackheads. At one point, while walking home Tre notices a toddler alone in the street. He angrily brings the baby to his mother, telling her to “keep the babies off the streets!” This doesn’t deter her from offering Tre sexual favors for crack. That’s life in this ‘hood, and these encounters are based on John Singleton’s own life experiences. Just 23 years old at the time, Singleton wrote and directed this film about people not unlike those he grew up with. As a director, he has a few missteps. Subtlety is not his strongest suit, and the film really hammers home its anti-violence message in the most straightforward way possible. There are also some bizarre tonal shifts in terms of music. The film’s score, especially near the beginning, is basically smooth jazz, and it feels really out of place given the subject matter. This is particularly noticeable when, in the very next scene, classic funk like Zapp & Roger’s “More Bounce to the Ounce” plays in the background. But these issues aren’t terribly important in the grand scheme of things because Boyz n the Hood is very, very effective in delivering its message. Inner city violence is still a major problem today, and unfortunately, not much has changed. I’m with you. Reaally like this one. To be honest it caught me off guard. I wasn’t expecting much from it but I remember being enthralled with it after finally watching. I wasn’t sure what to expect either, but this kind of blew me away. Great to hear you’re a fan as well, Keith. And thanks for the RT earlier! It’s been so long since I’ve seen this. I think I’m due for a re-watch. Great review! This is one of those films that I think is very good, yet could never re-watch because of how much of a downer it would be. Just the ramifications of the ending alone is pretty depressing, considering the film’s central theme of the importance of a father figure. Yeah, talk about a gut punch. What makes the film even more depressing is that nothing has really changed since 1991. So many areas are still stuck in that same cycle of violence. Whatta classic. Wish my dad was as cool as Furious. Good review Eric. Thanks man. 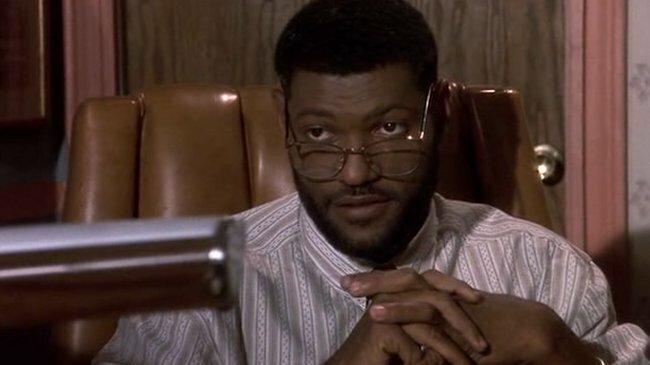 Gotta love ‘Larry’ Fishburne. My rating is the same, the situations and language feel authentic. Interesting you say it was based on John Singleton’s own life experiences. 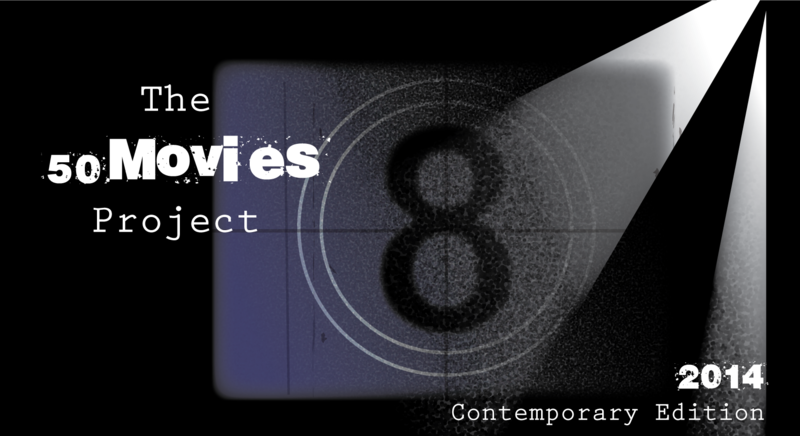 I remember reading in “1001 movies” how it paved the way for a wave of films about black America in the 90s. 80 people shot in Chicago during 4th July weekend, I’m shocked by that number. What do you think can be done about it? I hope some day in the distant future they forbid gun ownership altogether(unless military use and hunting weapons). I honestly don’t know, man. For the longest time, Chicago banned handguns in the city. but people could easily get them illegally on the streets (or in the ‘burbs). Now concealed weapons are legal and nothing has changed. There are groups out there that are trying to help (such as CeaseFire, covered in the documentary The Interrupters), but they can only do so much. I think part of the problem is that the city is cutting costs in areas that could really help. There have been huge budget cuts to the police department in the last few years, and the city recently shut down half of its mental health clinics. I just don’t get it. I loved this movie when I was younger, so much, in fact, that I decided I was going to be just like Cuba Gooding Jr (never mind that my life experiences couldn’t be more different than the character’s). And up I still had no idea Singleton was only 23 when he made it. Wow. Oh. And it is definitely sad how little has changed. But seriously, great to hear you’re a fan as well.